Public Art: Where to Start? As an artist it can be overwhelming to imagine translating your studio work into public art. Here are a few tips to help get your creative gears turning. Tip One: Determine what opportunities are right for you. CaFÉ and CODAworx are great resources for artists. These websites are updated regularly with RFQs (Request for Qualifications) and some of the opportunities are geared towards artists who have not yet completed their first work of public art. Read the call carefully, if a requirement is having completed two previous works of public art and you haven’t completed your first yet, it’s not the right fit. Connect with your local Public Arts Organization to learn more about opportunities in your area. If you are in the Denver area, Denver Arts and Venues is an excellent resource, they post opportunities and host various events through out the year geared towards educating artists about the Public Art selection process. Pictured: Denver painter, Kevin Sloan’s original work enlarged by local mural painters for our client Continuum Partners’ new development at 9th and Colorado in Denver. This is Sloan’s first work of public art and largest work to date. Tip Two: Research materials. So you’re a painter, that doesn’t mean you’re limited to only work with paint at a scale you are comfortable with. When Grand Peaks reached out to us to help them integrate public art onto an exterior wall we knew we needed to work with durable materials that could stand the test of time and stand up to Denver’s intense sun and fluctuating temperatures. Denver painter Elsa Sroka proposed a playful and imaginative composition that we had translated into ceramic tiles, increasing the longevity of the work while allowing Sroka to scale her work up for her first public art project without having to paint on a monumental scale. 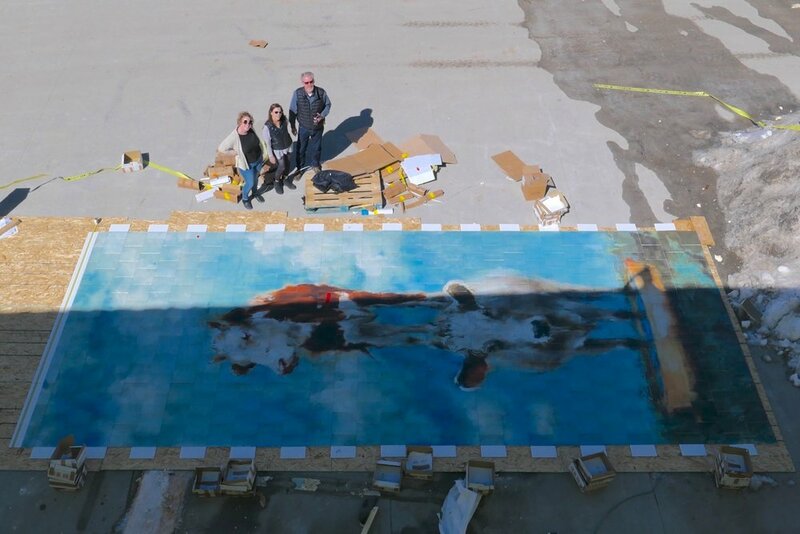 Pictured: Public Art Services Team with Artist Elsa Sroka after unpacking 387 ceramic tiles that will soon be installed on the exterior wall of Grand Peaks’ new development project, Spur at Iliff Station, coming to Aurora in Summer 2019. Tip Three: You don’t have to do it all! This is extremely important for artists to remember. There are trained professionals out there to assist in the creation of your work. Dream big! We work with skilled fabricators and engineerings through out the US and abroad who can help bring your creative vision to life. All you have to do is come up with the idea and we can help with the rest. Pictured: Donald Lipski’s SPOT installed at NYU Langone's new Hassenfeld Children's Hospital in New York in Summer 2018. We led a team of talented fabricators, engineerings, lighting designers and artists to help bring Lipski’s monumental vision to life. What are your burning questions surrounding public art? Leave a comment below to start a discussion.